Designed for distributed networking, Daxus allows high-speed data acquisition and logging to take place in one environment, such as on the factory floor, while the data can be simultaneously read and analyzed in a separate location. The technology is capable of stand-alone, stacked or networked data acquisition. Data can be accessed wirelessly and viewed in real-time on a PC or through the Daxus mobile app for smartphone/tablet, available exclusively from Astro-Med. 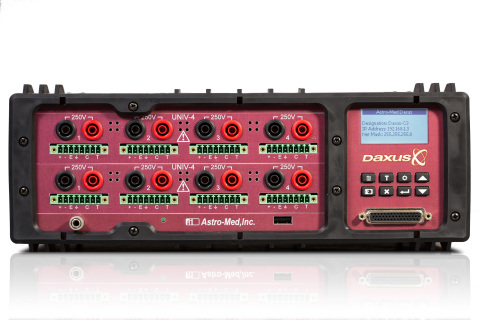 With its new distributed networking capability, Astro-Med now can offer a data acquisition system for new applications, including those in the automotive, process monitoring and product testing markets. Daxus acquires, processes and stores all data locally with no need for a PC connection. Users can record just a few signals or hundreds of parameters. Standing at just 4.7″ tall x 12.8″ wide (119mm tall x 324mm wide) and weighing just 7 lbs. (3 kg. ), Daxus is compact and tough enough for virtually any environment. Astro-Med designed Daxus to serve mobile users who want the convenience and power of networked data capture. When users are away from Daxus, they can view real-time waveform data from an ongoing acquisition or review previously recorded data on their PC, smartphone or tablet. Multiple Daxus units can be connected throughout large facilities for time synchronization of events. Daxus units also can be controlled and monitored from a central location via Ethernet or wireless networking. The Daxus mobile app allows users access to their data via a wireless connection for easy, real-time, remote analysis. Users also can set mobile alerts and review recent captures for immediate troubleshooting. The Daxus PC software is intuitive. There is no programming required and test setups can be done quickly to initiate data collection. The software menus provide complete configuration capabilities. Daxus software also includes powerful review, measurement and analysis capabilities. Some important features include the ability to express data in user-assigned Engineering Units, a meter package for displaying screen data in a graphical visual format and fully customizable waveform displays. As a world leader in the data acquisition and recording market since 1971, Astro-Med’s Test & Measurement group designs and manufactures data acquisition hardware, software, and supplies for the general industrial, aerospace, automotive, defense, metal mill, pulp and paper mill, and transportation markets. Astro-Med, Inc. (NASDAQ:ALOT) is also a leading manufacturer of high tech specialty printing systems and is a member of the Russell Microcap(R) Index. More information about the Daxus is available at www.Astro-Med.com/daxus and by calling 877-867-9783.